Peel 2 Organic Sweet Potatoes, cut into 1 inch cubes, steam 15 minutes let cool. Each sweet potato makes one pie. I hand pick my organic sweet potatoes for a shape conducive to easy peeling using a potato peeler. 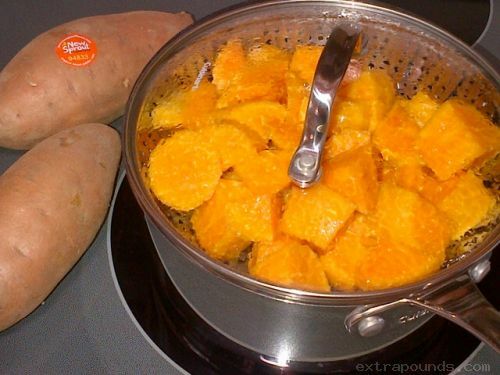 It only takes a minute to peel a sweet potato with a good potato peeler. Then slice every inch. Then I quarter those 1 inch disks. I steam the sweet potatoes for about ten minutes then start jabbing them until they’re soft, maybe 15 minutes total. The glycemic index is lower on sweet potato if steamed instead of baked. Baking changes the sugar in the sweet potato. Ready to make the pie mix. Combine all the ingredients in a Food Processor. They’re only $29 at Walmart if you don’t have one. Makes a creamier pie. Let me comment on the following ingredient list. You may notice variations from one pie post to the next, in Stevia, or spices, etc. This is because the base recipe is from the famous Libby’s Pumpkin Pie recipe on the back of a 15oz can of Libby’s Pumpkin. However, two sweet potatoes is almost always more fruit filling than a 15 ounces can size of pumpkin. So I adjust up or down depending on the amount of fruit filling. I sometimes use large sweet potatoes and use up to 2 cups of Stevia and more spices. Also, sometimes I like a little sweeter pie and add an extra half cup of Stevia as well. PER PIE. Doubled for 2 pies. Bake pie mix at 425 degrees for 9 minutes, and 21 to 26 minutes (depending on size of sweet potatoes) at 350 degrees. Pull them out early if the top starts cracking open. Finished 150 calorie 1/6th pie slice….delicious. No sugar* or wheat. I think it’s better chilled. Some like it hot. *small amount of sugar in Reddi Wip topping. 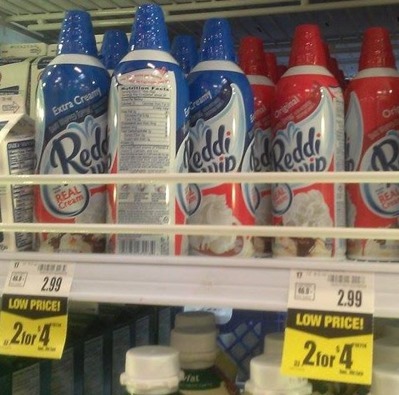 Use Reddi Wip Extra Creamy Real Cream topping. I understand it’s not pristine-clean but it’s a whole lot cleaner than the Cool Whip chemical concoction. I’m showing you better choices you can buy at most regular grocery stores and Walmart. You can get 100% pristine whipped topping from Whole Paychecks Food for about double what Reddi Wip costs. Or make it yourself if you’re a purist. This product is easy, assessable and completes these pies, it’s not dessert without whip cream, and will be the only real sugar grams in the dessert. Buy the dark blue container only. I would always stop in the grocery store and look at their pumpkin pies which were always darker in color and shinier. I figured out how they do that as well. I would always use a full can of evaporated milk in pumpkin pie mixes because the recipe called for a full can. However, a half can (instead of a full can) makes a much richer and darker mix. I actually discovered that a whole can was too much evaporated milk when making sweet potato pie or butternut squash. Baked sweet potatoes and butternut squash has a lot of moisture naturally. A whole can of evaporated milk makes the mix way to wet. It makes a fluffier, lighter pie, but I like a richer darker pie. So Tip #1: only use a half can of evaporated milk instead of a whole can for a darker richer pie (for 2 pies). Tip #2: add a tablespoon of Butter (100 calories) in the mixer or food processor (for 2 pies) and it gives you a shiny pie top. Tip #3: add 1.5+ teaspoon of vanilla extract to the pie mix for a tastier pie. Tip #4: It takes a medium sized sweet potato for one thin pie. That’s a sweet potato about the size of a man’s balled up fist. I steam (not bake) 2 medium sized sweet potatoes to make 2 pies at a time. Tip #5: for 2 sweet potatoes use a whole cup (instead of 3/4 cup) of stevia and a bit more of cinnamon, ginger, cloves, sea salt. Tip #6: Use Fat-Free Carnation Evaporated Milk as it’s the only option that doesn’t have Carrageenan. Carrageenan is a source for monosodium glutamate (MSG). Tip #7: Bake pie mix at 425 degrees for 9 minutes, and 21 minutes at 350 degrees. The caveats: When making sweet potato or butternut squash pies where there’s more than a 15 oz. can size amount (like pumpkin) add a quarter cup extra stevia. Add a little more cinnamon, ginger, and cloves also. Also add 1.5 to 2 teaspoons of vanilla extract for a tastier pie. Cut back on Evaporated Milk to a half can. Add a tablespoon of light butter for a shiny pie-top.